These universal header dual exhaust kits feature aluminized tubing with free-flowing mandrel bends for longevity and maximum power, as well as side exit tailpipes for in front of the rear wheels. Straight and pre-bent tubes, clamps, reducers with flex tube and installation hardware are included (mufflers are not included). 30560 is rated 3.8 out of 5 by 4. Rated 5 out of 5 by steve04 from great kit I purchased it last week and installed it this weekend. Kit works great.. inexpensive but very hi quality !!! Rated 4 out of 5 by zebulyn70 from Great fit I used the flexible pipes to connect my headers to the original exhaust and it worked perfect. Have plenty of exhaust pieces left over for something else. Put it together how it was intended but wouldn't look right on my long box 68 Chevy but might work on a car. 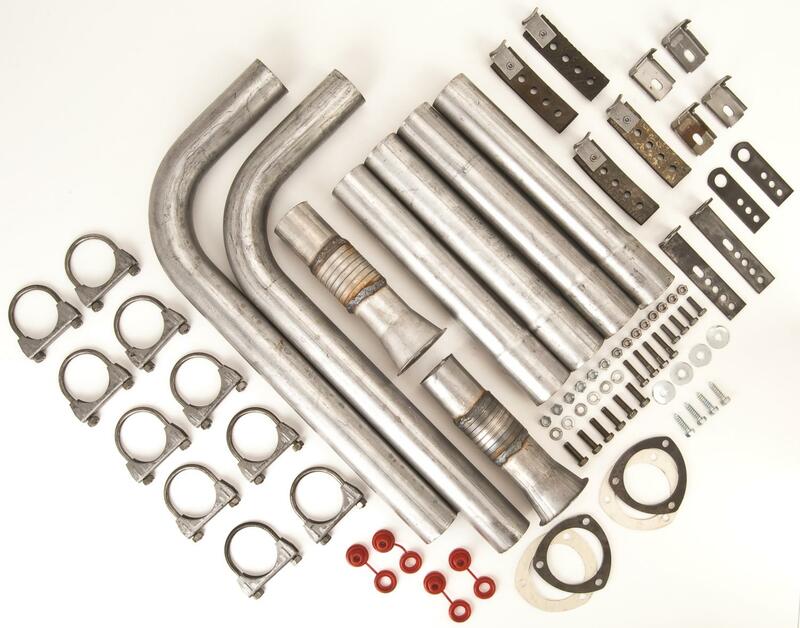 This kit was designed for an older vehicle with under chassis headers and no catalytic converters. It exits in front of the rear wheels on either side. It would require extensive modification to fit a car like a G8. Will this system work on my 2002 Mustang v6? This is a universal application and you should be able to make it work for your Mustang. A 2 inch muffler will not work on this kit. It will have to be 2.25 mufflers.